As we all enjoy our Thanksgiving dinner here in the United States here is a photo I would like to share with you and the rest of the world. 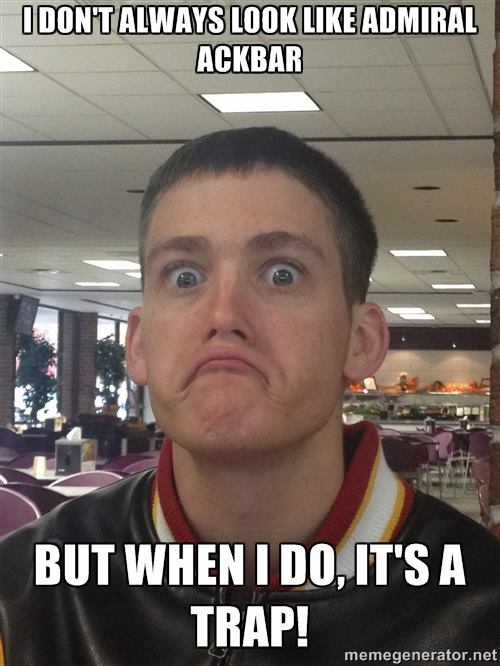 Here is a meme made of my friend and what we all call his “IT’S A TRAP!” face. I don’t think this photo shows his best of this face but it shows it none the less. It was a fun day when he showed us all this face and his buddy said he would make a meme about it. Let’s see how many people see this photo. It would be cool if it started trending, then everyone would start using it. The real Admiral Ackbar. (Or at least what he might look like as a human.) Come to think of it, I think I remember the day this photo was taken.